Summary: Ruthie is happily adjusting to life in 1960’s Queens, New York, where her family has settled after escaping Castro’s Cuba. She’s just been promoted from the “dumb class” and has a new pair of coveted go-go boots when her father surprises the family one night with a new car. Off they go to visit family friends on Staten Island, but on the way home, tragedy strikes. 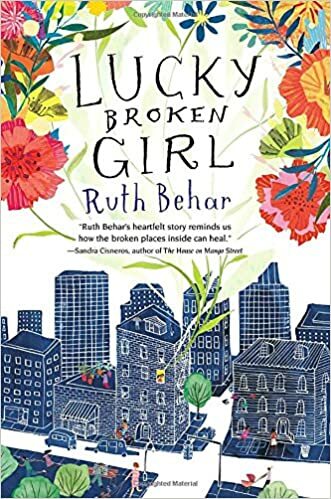 A car accident leaves five teenagers dead, a woman paralyzed, and Ruthie with her leg so badly broken that she is put in a body cast and bedridden for nearly a year. Stuck in the family’s small apartment, having to use a bedpan, and unable to eat much for fear of outgrowing her cast, Ruthie is forced to draw on her own resources. She discovers reading, writing, and painting, and comes to appreciate the friends and family members who work hard to keep her spirits up. When she is finally released from the cast, she struggles to overcome her fears of reinjuring herself, and again learns to find the courage to leave her bed, venture outside, and eventually return to school. She must heal from being broken, but as the title says, she learns to count herself lucky as well. 256 pages; grades 4-8. Pros: Based on the author’s childhood experience, this is a story of immigrants struggling to find a home in America and a girl struggling to find her way through an extremely debilitating injury. Behar writes unflinchingly of her fears and how she was able to keep pushing through them. Cons: My claustrophobia started kicking in around month 4 of the body cast experience.